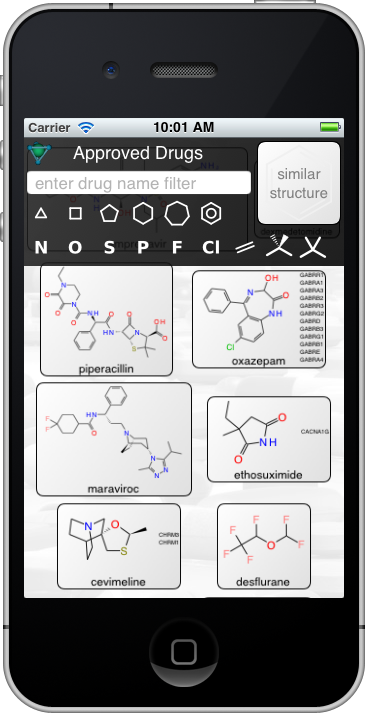 The Approved Drugs app has a new version awaiting review on the AppStore which adds drug targets and synonyms. The target codes have been integrated from the supplementary information of a recent Nature paper describing the prediction of side-effect targets (Lounkine, Keiser, et al), and provide data for 500 or so of the entries. 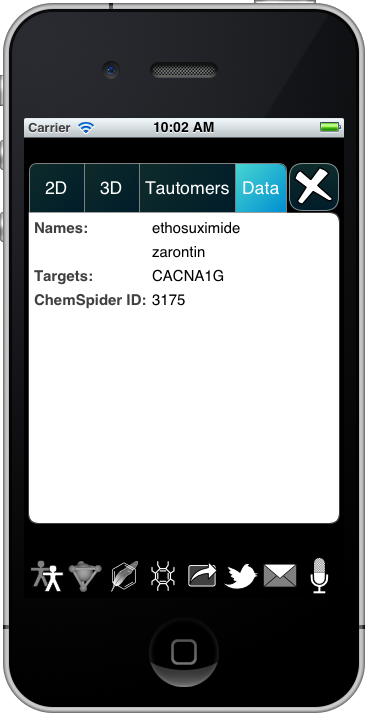 Synonyms have been obtained by using the ChemSpider API, combined with some automated filters and manual verification to restrict the list to common trade names. The new tab lists the primary name and all of its synonyms, and any known targets. While synonyms are not shown in the main view, they are searchable, i.e. a text search for ethosuximide or zarontin will both turn up the same drug. If all goes well, the new version should be available in a week or so.